Super Hero Boy: Thomas mania! Connor is just starting to really understand how cool trains are. We actually went on his second train ride ever on Saturday, at the zoo a few miles away. The look on his little face when we go through the tunnels is priceless, his eyes get huge and as soon as we get through the the tunnel its all smiles. He just doesn't quite understand that the conductor cannot hear him when he talks back to the speaker. heh. Speaking of trains, September is an exciting month as Thomas just released his new movie on DVD. Thomas & Friends : The Great Discovery is fabulous and you may just recognize the voice of the narrator, Pierce Brosnan! Sondar Day is coming and all the Engines are a buzz trying to get ready for the big day. The day would be perfect it wasn't for the fact that a new engine is in town and Thomas feels threatened. Though Thomas is jealous of Stanley in the end its Stanley who teaches Thomas about friendship and teamwork. All the while Thomas ends up making a discovery that will change Sondor Day all together. Thomas accidentally stumbles across the long lost town of Great Waterton. Sir Topham Hat is so excited he declares that they will restore the town of Great Waterton for the Sondar Day celebration. Don't you wish it was just that easy to restore a whole town? heh. I know we will be celebrating Sondar Day quite a few times around here as Connor is crazy about Thomas and I'm sure I will be watching this DVD often in the upcoming months. 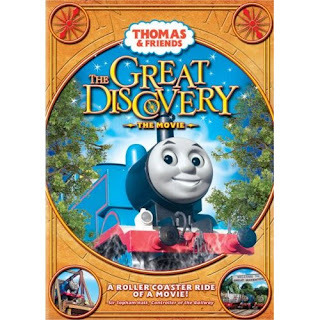 Thomas & Friends : The Great Discovery will be released on Sept 9th and is available on Amazon! Leave a comment on this post. Check out Thomas & Friends : The Great Discovery and tell me which Thomas character is your favorite! Percy is a favorite in our house. I think we have every Percy out there. My son would love this dvd. Thomas is my son's favorite! Thomas, that is my nephews fave so that has to be mine too! karissag [@]gmail.com subscribed in feed! Thomas is my favorite-it's my grandsons name. Thomas is our favorite. Thank you for this giveaway! Thank you for having this. My son's favorite is Thomas but my daughters' favorite is Lady. Thank you! My son says that Gordon is his favorite. I like Bertie the bus. Thomas is def the fav here! Thomas is the one. Thank you! You can never have a better character than Thomas. We love Thomas because it is our little boy's name. Our favorite has to be Thomas himself, this is such a great show. Thanks so much for the great opportunity! I like Mr. Conductor! Percy is my son's favorite. (He's green). They're all great, but our favorite is Thomas. We have always liked Henry, but my son renamed him "Loo Loo". We love Thomas at our house! My grandson and I love Thomas! All the characters, of course, add to the show but Thomas is our favorite. My son is a huge Thomas fan. I just asked him who his favorite is and he said James....but it changes every week. We saw this at the movies a while ago, it was my son's first Big Screen Movie Experience....it was awesome! Ok have I mentioned yet that my son is seriously crazy about all things thomas. But Thomas is not his favorite - that would be Cranky the Crane. My favorite character is Percy. My name is Jennifer and my email address is highlandercpa@yahoo.com. next to thomas, we like Percy! My son is scared of Diesel. I dont know why, he's 4, he just say Daddy im scared of Diesel! my little man loves Thomas and Harold the helicoper! My nephew's favorite is Thomas. I would love to have this for him. We love Percy at our house! Of course they are all adorable in their own way. Thanks for the giveaway! Thomas himself is my favorite! My little grandson loves all things Thomas! While he likes all of the characters, Thomas is his very favorite and he has a Thomas shirt, Thomas blanket, etc. Thomas himself ... he's the favorite. would have to be thomas!my boys really enjoy this show! Thomas are the kids favorite but I like Sir Topham Hat! Ian loves Thomas, so he's the winner here. We like Thomas and Percy. My grandson loves Thomas and all of the other trains, especially James. But Thomas is his favorite overall. Thomas is my (and my son's) favorite. Thomas is the favorite here!